From page one I was completely entertained by Wesley Chu’s debut novel The Lives of Tao. The premise was fun, the pace was exciting, the writing was engaging, the story was compelling, the characters were likeable, and the humor was appealing. There’s a major twist at the end that, although I saw it coming, I was excited about. I can’t wait for the sequel, The Deaths of Tao. I’m listening to the audio version produced by Brilliance Audio. It’s read by Mikael Naramore who was perfect. 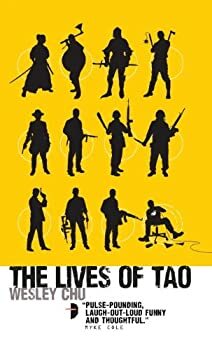 First of all, let me discuss what I liked about Wesley Chu’s The Lives of Tao. The book is imaginative, filled with action and adventure. Many parts are funny. Chu turns the standard secret-agent-in-training trope into a shameless, almost glorious free-for-all of fantasy wish-fulfillment. The book has secret bases, oodles of weapons, a luxury submarine — and the nebbishy guy gets the hot girl. It’s Ian Fleming with aliens and lattes instead of martinis. Many millions of years ago, a shipful of aliens, the Quasing, crashed on earth. The Quasing are energy-based, non-corporeal, and our sun’s radiation is fatal to them. They could protect themselves, though, by taking refuge inside another life form. Eventually, they began to inhabit primates, and have been affecting human evolution ever since. Over the ages, the Quasing split into two groups. One sees all of Earth, including humans, as an exploitable resource. The other, rebellious group decided somewhere along the way that humanity should have control of its own destiny, at least to some extent. These two groups have been engaged in a cold war for millennia. When Tao, one of the rebels, loses his human host on a mission (the host sacrifices himself so that Tao can escape and live), Tao leaps into the body of a couch-potato IT tech, Roen Tan. Tan is an out-of-shape, low-self-esteeming, junk-food-eating whiner, and Tao needs to turn him into a field operative. There are tough times ahead for both Tao and Roen. Instead of following one mission from start to finish, the book bounces between various assignments, mixed with Roen’s training sessions on hand-to-hand combat, surveillance, and weapons training. Roen meets many others who are possessed by the Quasing, both friend and foe, and begins to develop some self-confidence and a larger, more comprehensive world view. During down times, Tao shares with Roen summarized versions of several of his lives with his many human hosts, including Temujin or Genghis Khan, and the first Ming Dynasty emperor. These summaries show how the Quasing have been changed by their time here, a fact the reader twigs to before Tao does. Those are the things I liked. I had some problems with the book, though, and they mostly had to do with the writer’s contract with the reader. Speculative fiction, more than any other genre, requires a willing suspension of disbelief from the reader. The writer’s part of that deal is to deliver a world that is plausible, detailed and engaging. If the writer’s approach is, “You have to believe any lame thing I tell you because I’m the writer,” the reader will rebel. Missing details, and some inconsistencies, gradually drove me out of The Lives of Tao. They started small, like a couple of barnacles on the hull of a boat, but they accreted, and pretty soon I was more concerned about the seaworthiness of the vessel than the pleasure of the cruise. If Chu tells us how many Quasing survived the crash, I missed it. I never knew or understood exactly how many there were. Are there thousands? Hundreds? A few, and we’ve met them all? I don’t know. I don’t know if these non-corporeal beings are gendered the same way we are. It seems as if they are gendered; Tao is a “he” and his friend Baji is a “she,” but I don’t know if that’s because Baji’s human host is female. Later in the book a “male” Quasing takes up residence in a female human. The pronoun for the Quasing remains male, and I remain confused. I don’t know how, or if, Quasing reproduce. In order to create a twist ending, Chu hides this information from the readers, limiting himself to one brief line in some banter between Roen and Tao. When Quasing reproduction becomes a plot point at the end of the book it felt totally unsupported to me. A lot of time is spent watching Roen work out with the irascible Chinese martial arts instructor or Sonya, Baji’s host, and not enough on background. Another example is tiny and picky, but I use it because it goes to the idea of grounding a story in detail. Early in the story, Roen whines to Tao that he has to keep working at a job he hates because he has rent to pay and “a cat to support.” It’s a cute throw-away line, undermined by the fact that there is no cat in Roen’s apartment (in which we spend a lot of time) until page 271. I suppose it could have been hiding under the couch that whole time, which in story terms is seven months, but I don’t think so. The hot girlfriend is treated in a similar way. Her job takes her to Europe for months at a time and she conveniently comes home during slack times in Roen’s training, except for the ending when she shows up just in time to be placed in jeopardy. All these small things chipped away at my pleasure in this book. Chu has a vivid imagination and a great sense of humor, and must have grown up playing first-person shooter games and/or watching James Bond movies. That comes through in The Lives of Tao. I just hope the sequel, The Deaths of Tao, which came out in October, is written with a bit more care. I do have to say that Angry Robot’s cover of The Lives of Tao is wonderful. I rarely use the word “witty” to describe a cover, but this one is, and there’s a nice nod to Fleming right on the cover, for those fans who watch the Bond movies. Keep up the good work, Angry Robot. Tao is being too hard on himself with the Genghis Khan thing — Genghis was a strong feminist. That’s got to count for something. So glad you liked it and looks like I may have to reread it on audio some day. That’s very good to hear. Great review, thanks. And thanks for the recommendation, Bryce. You’re the reason I moved it up to the top of the stack. I’m reading it right now and enjoying it quite a bit. It’s a fun book. That said, I see your points, and the bit about the cat did not occur to me until I read your review! You’re quite right, where is the cat? I’ve been wondering about this book. Thank you for your review.